If you buy a bottle of chocolate milkshake, you will find that it is loaded with a huge amount of sugar, often more that a can of fizzy cola. By following this milkshake recipe, you can cut out lots of that sugar, without losing any of the taste. Whenever we make a chocolate milkshake, we like to add a really ripe banana - the riper the better, as it adds a sweetness to the drink and a creamy texture. Surprisingly, cocoa powder actually contains very little sugar and is packed with a rich chocolatey taste, so we use this for the main flavour. Optional extra recipe ingredients include honey (for added sweetness), yoghurt, vanilla ice cream and even cottage cheese (for extra protein). For a more fruity milkshake, simply swap the cocoa powder with some frozen strawberries, raspberries or blueberries. Peel the banana and place in a liquidiser / blender, together with the milk, the chocolate ice cream, the cocoa powder, the ice cubes and the spoonful of honey. 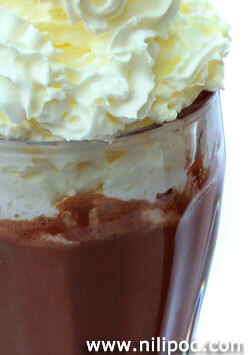 Turn on the blender for a minute or two, until your milkshake mixture is smooth and creamy. 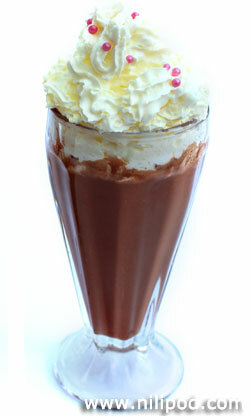 We like to serve this indulgent drink in American diner style glasses, for an authentic appearance, with some squirty cream on the top.